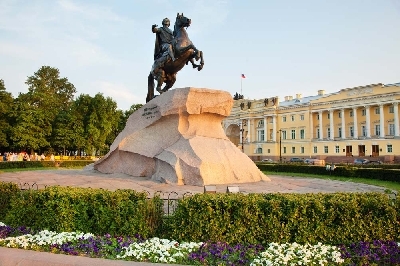 Bronze Horseman on Senate Square - is the monument to the great Emperor Peter the First, which was glorified by famous Russian poet Alexander Pushkin. 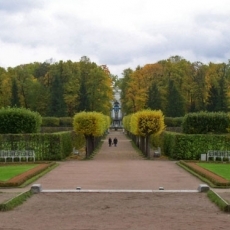 This monument is one of the main symbols of Saint-Petersburg. 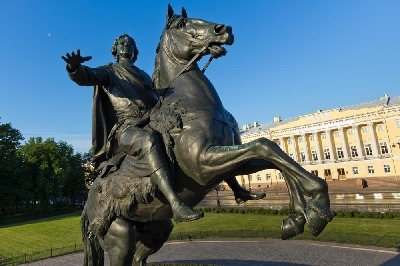 Bronze Horseman - is a model of the equestrian statue of Peter the Great - it is the most famous monument to the Emperor. A lot of tourists come here, to Senate Square, to appreciate the beauty and monumentalism of this wonderful architectural memorial. 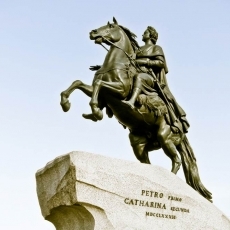 Monument to Peter I adorns the Senate Square - the most longstanding square of the Northern Capital. 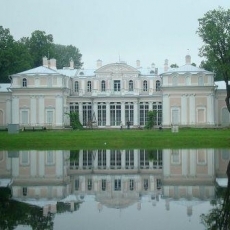 It dates from the beginning of the XVIII century. 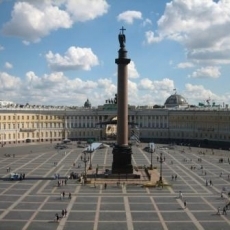 Earlier the Senate Square was the part of the square in front of the Admiralty, but with the loss of its purpose as a fortress, this territory turned into a municipal area. 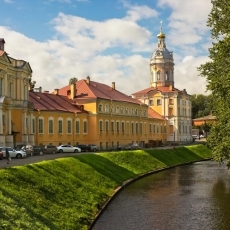 It got its name thanks to the government department Senate, located on this territory in 1763. The square formed in 1834. This had contributed by the construction of the Senate and Synod building in this area. 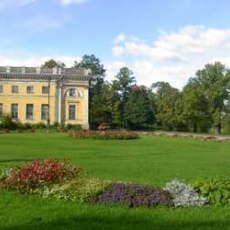 The building, which was erected in the Russian classicism style under the management of the architect A. E. Shtauberd, is the architectural monument. 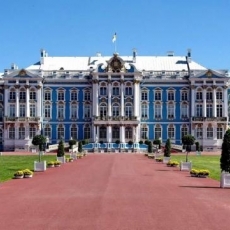 The construction of the buildings was completely finished by 1832, the decoration of the inner interiors began. 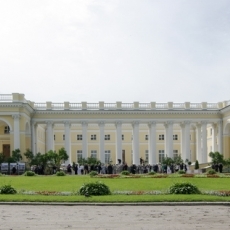 A lot of masters took part in stucco works, works with marble, furniture designs. Master Torrichelli created the most difficult elements of the decorative molding. In one of the corner halls there is a church. This temple was a unique one because of the fact, that it is the only one church with the cupola, equipped with the glass lantern. The adjoining arch over Galernaya Street is the symbol of the unite of the state and the church. For the creation of this arch one of the designs by C. Rossi, which he didn't use in the ensemble of the Palace Square, was used. The height of the triumphal arch is more than 25 meters and its width is 20 meters. 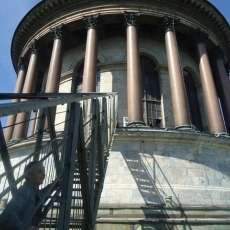 The sculptural ensemble "Godliness and Justice" is located over the arch. The bas-reliefs, which decorates the arch, flashy with the allegories to the Russian legislation and glorify the power of the state. For a very long time, since 1925, in the halls of the Senate and Synod building there was the Historical Archive of the Russian Federation. Nowadays, there is the Constitutional Court of Russia and Boris Yeltsin Presidential Library. 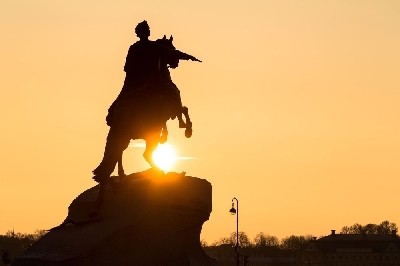 The Bronze Horseman got its name thanks to the poem of the same name by the great Russian poet Alexander Sergeevich Pushkin. 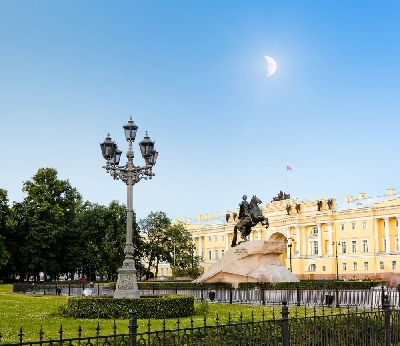 The sculpture was designed by the architect E. Falconet by the decree of the Empress Catherine II and with the assistance of his apprentices and followers (in particular, the head was made by M. A. Collo, and the snake under the hooves of the stallion - by sculptor F. Gordeev). The base of the monument is the natural rock, also known as the "Thunder-stone", which is still covered with legends and rumors. 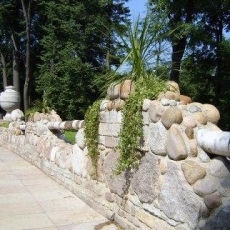 The stone monolith, which height was supposed to be 11 meters and more, was needed. Thanks to the Academy of Arts such stone was founded in Lahta area. So, according to the legend, the lightning hit the rock but didn't break it and just made a crack. Since that time, this monolith was called the "Thunder-stone". The wavy shape of the stone reminds that Peter the Great created the "window" not just in Europe, but also to the sea for our country. Monoliths with the approximately similar mass were transported just in ancient time, so the moving of this stone in the XVIII century was a big deal. The snake under the stallion of the Emperor Peter I symbolizes the enemy, which threatened Russia in different times and with whom the great commander successfully fight. Allegory to his victory - laurel wreath and belt sword. 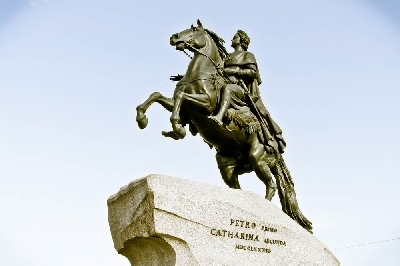 The inscription on the pedestal says: "To Peter I from Catherine II. 1782". Catherine II always paralleled his acts and herself, considering herself as successor to his achievements.